A man from Beaumont TX is suing Union Pacific Railroad for his injuries after a February 2013 crash that happened on a Beaumont railroad crossing on Highway 90. The man was driving a big rig hauling a crane when the trailer got stuck at the crossing. He hopped out of his truck to look at the damage, and then a train slammed into his rig. The lawsuit alleges that he suffered mental and physical injuries. The man’s attorneys stated that the trucker did not have a clear view of the stretch of tracks when he got out of his rig. The lawsuit further alleges that the train operators did not blow the horn when they approached the crossing, and they were not paying attention to the tracks when the crash happened. We often represent injured clients who were hit by trains at railroad crossings. By using retired railroad workers as investigators, we are able to investigate the circumstances of the crossing and also we can pick up the phone and speak to other experts on railroad crossings. For example, we have represented people who were hit at railroad crossings and we were able to show that appropriate warnings were not followed at the crossing. In some cases, the vegetation was not properly cut around the tracks, which meant that drivers did not have a clear view of oncoming trains. In other cases, the train operators failed to blow their whistle, leading to a collision. Amtrak and CSX have teamed up with local police agencies in the Rochester NY area to remind drivers to take care around railroad crossings. The safety effort started this week along King Road in Chili NY near Rochester. This railroad crossing was the site of a fatal car and train crash in 2015. Investigators stated that the crossing gates came down and an Amtrak train came through. Before the gates went up, a driver crossed into the path of a CSX train and was killed. CSX and Amtrak stated that drivers need to be sure that they always yield to signs and signals at railroad crossings. The Federal Railroad Administration parroted this message during this safety blitz, and the FRA has promoted a mobile phone app that it is working with Google to add alerts about upcoming railroad crossings on its GPS mapping systems. Railroad crossing accidents are far too common in the US. Thousands of people are killed or injured each year because of these accidents. In fact, the FRA tells us that cars and trains hit each other every 12 minutes in the US. But contrary to the message promoted by the railroads, the motorist is not exclusively at fault in the causal analysis of tragedies that occur at railroad crossings. Take as one example stop signs added at railroad crossings in many rural areas. One would think that adding a stop sign at a railroad crossing would be a logical, solid idea to avoid tragedies where railroad trains strike cars or vehicles causing tragic injuries or deaths. In fact, a major study that I blogged about years ago found just the opposite, adding stop signs at many rural crossings increased crossing collisions rather than decrease them. Car drivers clearly need to use great caution around railroad crossings, keeping in mind that modern Amtrak trains travel up to 79 mph and some freight trains travel at 55 or 60 miles an hour. A train can be traveling at 60 MPH or more and appear from around the bend at a railroad crossing in a split second. Maintenance problems: Sometimes the railroad crossing collision is caused due to the lack of light sport gates at a busy railroad crossing. Or, trees or shrub vegetation has grown up around the railroad crossing tracks that obscured the driver’s vision. Train/railroad engineer operator error: In a study of 10,000 car/train accidents, human error was involved in almost 35% of them. Some of these were due to a sleepy train operator. Distracted railroad transportation personnel (engineers or conductors): Train crews, just like car drivers, can become distracted by cell phones, the radio and other things, although more recently the use of cell phones has been banned during regular train operations. Active gates and lights failure: There have been railroad crossing collisions where the gates malfunctioned, and even trapped a car on the tracks with a train approaching. If you are involved in a railroad crossing accident, an experienced railroad crossing injury lawyer will be able to review all of the evidence of the crash, including video from the locomotive’s on board cameras, data event recorders and signalization information. An experienced railroad crossing injury lawyer may assist in determining if the railroad was to blame, which can result in a financial settlement to compensate you for your injuries, pain and suffering. The widow of a Steele MO man who died in a rail road crossing crash in 2012 won $20 million last month in a wrongful death lawsuit verdict. After just two hours of deliberation, the jury returned a verdict favoring the plaintiff against Burlington Northern Santa Fe Railway. The deceased was a successful and well-known businessman who owned several lumber mills. The late businessman died in a crash with a BNSF train on Oct. 20, 2012. The crash occurred when Spence drove his Chevrolet Silverado over railroad tracks on Stoddard County Road 470 in Steele. The only signal at this crossing was a railroad crossing sign without lights and gates. BNSF stated in reaction to the verdict that there was no negligence by BNSF, and it claimed that the evidence showed that the man did not stop at the railroad tracks. However, the man’s family stated in response that BNSF needs to improve all of its railroad crossings by cutting down vegetation that obscures sight lines for drivers. They also urged that the railroad install lights and gates at all public crossings. The plaintiffs also argued that the crossing was defective due to inadequate sight distances and no lights and gates. It is common for many people to not realize that the railroad is responsible for maintaining the safety of public railroad crossings. One of the sources that apply to the proper maintenance of shrubs and vegetation at railroad crossings is the Manual of Uniform Traffic Control Devices. this publication has details about the sight lines that should be available for drivers coming to a railroad crossing. It is common for overgrown vegetation at crossings to prevent the driver from seeing the approaching train. Many railroads will try to argue, as BNSF did, that the driver was at fault for not stopping. Fortunately, the jury did not buy that argument in this incident. 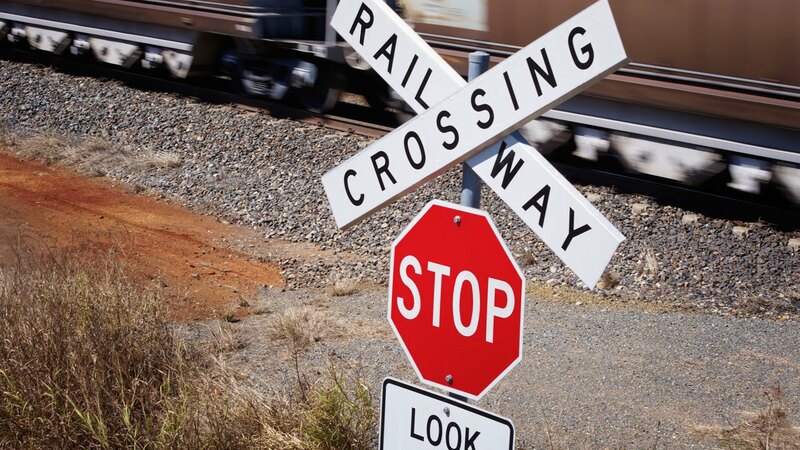 As railroad crossing accident attorneys in Virginia, we have handled many railroad crossing incidents over the years. When we are retained for a railroad crash personal injury case, we often employ retired railroad workers to investigate the incident so that we have the highest chance possible of recovering damages for the client. A deadly railroad crossing accident in Gilroy CA last year involving a Union Pacific maintenance vehicle has raised serious safety questions about these type of vehicles traveling through crossings and whether they always trigger crossing gates and lights. The man who died, Don Williams, 55, was driving through the railroad crossing in Gilroy at Masten Avenue when his truck was blindsided by a maintenance of way vehicle that weighed 50 tons. According to the state highway patrol crash inquiry, the UP vehicle did not activate the grade crossing gates or signal lights. Investigations by the California Highway Patrol and the Federal Railroad Administration determined that the UP driver had operated the rig negligently and violated several UP company safety policies. A warrant is out for his arrest. Beyond the tragic death of Williams, this accident highlights what some railroad safety experts say is a major flaw in the way in which maintenance of way vehicles and other rail vehicles operate on the nation’s railroads. 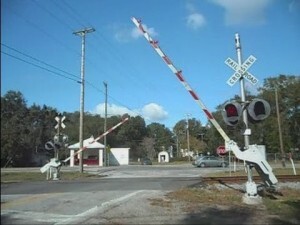 That is, they do not always activate bells and gates at railroad crossings. The railroad crossing in question does have bells and lights but it was not functioning when he crossed the tracks because the rig did not ‘shunt’ the track. The wheels of the vehicle did not make electrical contact, so when the driver came to the crossing, there was no warning for drivers. The FRA states that this is a common problem. The agency released a new safety recommendation last week in light of William’s death. FRA advised all railroads to review their procedures for how maintenance of way vehicles go through crossings. The new FRA recommendations note that the crossing activation system is unreliable and all maintenance of way vehicles must approach railroad crossings slowly. However, these are only recommendations and there are no current federal regulations for how these vehicles go through railroad crossings. Also, the technology that is still used to detect trains today was first designed in 1872, and continues to be used across the country. Our railroad accident attorneys in Virginia are greatly concerned that some maintenance of way vehicles do not properly trigger crossing gates and lights at railroad crossings. It also is alarming that a train engineer in this case apparently neglected his duties and proceeded through a railroad crossing with blatant disregard for safety. There are cases where a railroad and its employees disregard public safety and should be sued in civil court for damages. This provides a warning to other companies and individuals to always put public safety first. An experienced railroad injury attorney can often win a large financial settlement in cases where the railroad obviously acted in a negligent fashion.